I've just sat down and updated my work diary, mapping out my life until the end of December and it's scary stuff. Add in personal commitments, such as trips to the Knitting and Crochet Guild, holidays and Woolfest, along with the odd spinning guild meeting and LARP related event and it looks like I'm one very busy lady again this year. I'd made a deliberate effort to free up some time this year, but it seems that as quickly as I make spaces in my diary, other things leap in there to fill the gap. Bizarre. Saturday, Dave abandonned me for the weekend as he headed off to Nottingham for some ork related fun at Games Workshop, otherwise known in our house as the WAAAGH!!! (already documented by Richard). Dave, for those who do not know him, is rather ork obsessed and he's spent the past couple of months on a painting marathon requiring me to pass comment on a multitude of shades of green as I've admired ork after ork that has been waved in front of me. I'm hoping the orks are out of his system a bit now, as there are weapons in the shed that need latexing, masks that need painting (and undoubtedly more latex) and plotting that needs to be done! With Dave off engaged in his war game, I was left to do what seemed to be a huge amount of housework in his absence. I also set to tackling the outstanding pile of paperwork, which I'll admit had got out of hand. I was firm with myself and the chores, plus paper pushing got done... I have a fine collection of papercuts (which sting mightily) to prove it! All this industriousness on my part meant that I didn't have much time to do fun stuff over the weekend... But I did try to deal with a couple of hurdles to 'finishing' that have been hanging over me. Weeks ago, in the middle of January, I started to crochet a pair of mittens. I actually finished making up all the pieces a while back, but as the mittens are worked in flat pieces and then sewn together, they've been waiting for me to get my act together. Before I can sew them together, I need all the pieces to be approximately the same size as it kind of helps to match up the edges, which meant that blocking was essential. I've crocheted the mittens in a superwash wool, but wasn't taking any chances and with the brief showing of the sun on Saturday, decided that now was an ideal time for wet blocking. This wasn't a particularly onerous task. 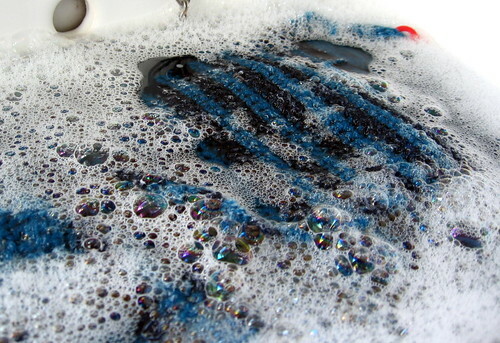 I filled a wash basin with warm (not in any way hot) soapy water using a liquid wool wash and gently placed the mitten pieces in the water. I left them to soak for about half an hour then removed them from the soapy water, replacing it with similarly tepid clean water. 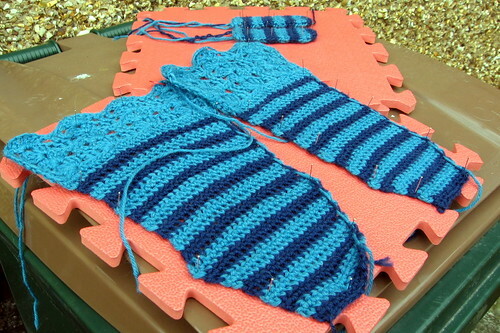 The mitten pieces were left in the clean water for another half an hour, then I put them on a folded towel. The towel got rolled up and I stomped up and down on it for a while (a great stress reliever) to get the water out. I keep hearing about using the spin cycle on the washing machine for this and when I graduate onto sweaters/jumpers, I may well opt for technology rather than stomping, but for my little mitten pieces, stomping was good. Once I'd got most the water out, I pinned the mitten pieces out on foam boards stretching them so they were all about the same size. Then I put the boards outside to dry. Sadly, the sunshine only lasted for Saturday but the pieces were dry by Monday morning. I wasn't taking any chances though and left them pinned to the boards until yesterday morning. Now I just need to persuade myself to sew them together.